This Lacoste Men’s watch is stunning blend of old and new. The stainless steel case, beige dial, 3 hands, date window, minute markers and Lacoste logo with engineered crown sets this watch apart from all others. Partnered with a black calfskin strap and tang buckle. 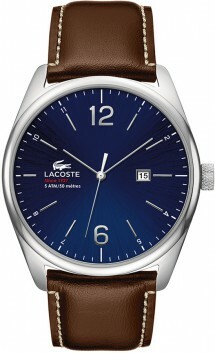 This Men’s Lacoste watch is a classic design married with the new.